Because reasons, it’s taken me all week to write this post. I’ll explain later. Some of my friends are aware of my dumb luck. It mostly involves me getting rewarded for insignificant things in my life, and is of limited assistance in more significant life issues. I’m sure there’s a more scientific, reasonable explanation, but I’ll be damned if I can figure it out. I experienced one of these “dumb luck” moments last weekend. The weekend before, while at Target with the kids, I noticed the package pictured below. What caught my eye was the red figure to the left of the silhouette, Red Robin. Red Robin is the third Robin, Tim Drake, when he went out on his own while Batman was believed dead. I really liked the Red Robin costume, especially the version just before the Flashpoint event. It’s a very strong, sleek design with good color and tone balance, especially after they dumped the peplums on the tunic. 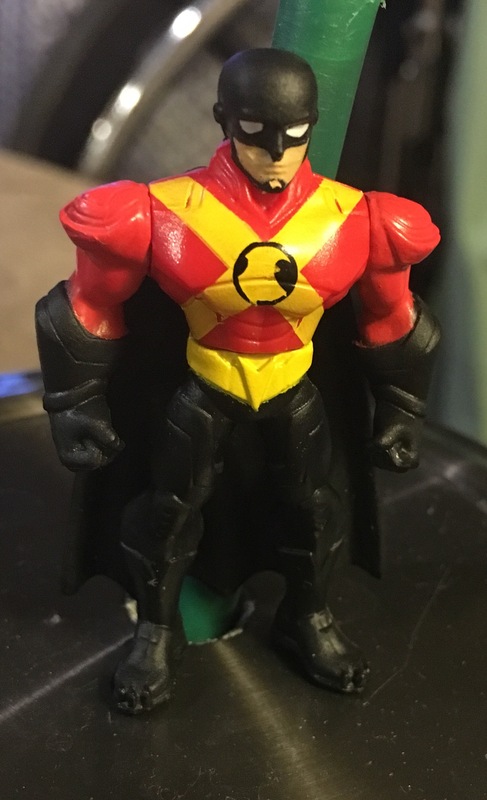 From the looks of the package, it looked like the version of the character I like. 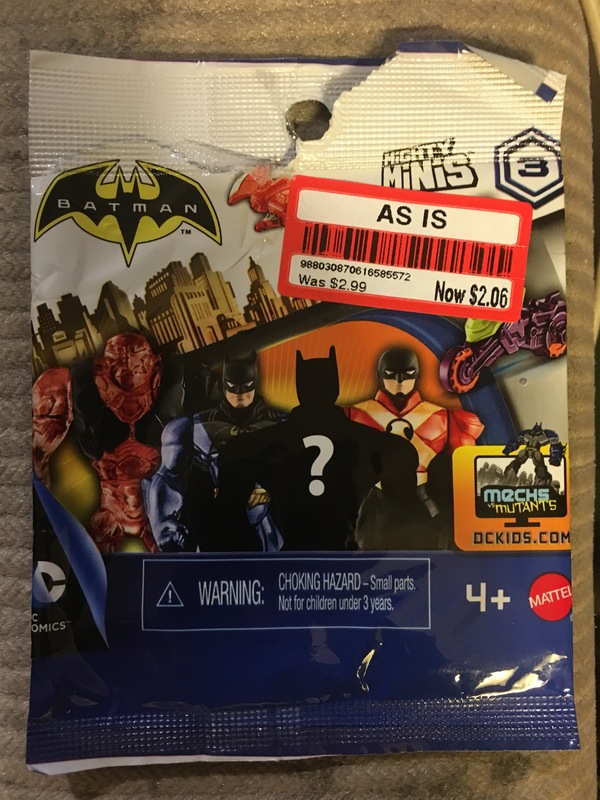 These are sold as blind packs, so you can’t just buy the one you want. Looking at them, I thought “I can afford to get a couple of these and maybe I’ll get lucky and get the Red Robin, the one I really want.” I purchased two and took them home. No dice. I got two of the same Batman figures, and I gave one of them to one of the kids. Last weekend, I figured I could afford to buy a couple more packs and try again. I got to the Target, and found the endcap, but all the packages were gone. I poked around for a few minutes, and found one last package. I decided I’d take the chance and pick it up, along with a couple of other items I wanted. I figured if I didn’t get what I wanted, I could get one on eBay. As soon as I got to the car, I opened the package, and my dumb luck held out. The only package left had in it the figure I had wanted from the beginning. I’m thinking of doing some touch up on the figure, as I can easily see some flaws, like the gaps in the yellow bandoliers on the chest, and the slop on the chin guard. I’m a little nervous about doing that and screwing it up. I might get the professional mini painter I know to touch it up. In the end, I truly cannot understand how this sort of stuff works out for me, but other things in life, like job hunting and the lottery don’t. I just don’t get it. Last week was been hell on my sleep, and it’s all been related to my mother. She’s backslid quite a bit in the three or four weeks since the physical therapist stopped coming out. The therapist had been coming since before Mom’s trip to the rehab home in November, and the therapist released Mom in mid-January. Now, again Mom has to struggle to get to the bathroom and bedroom at night. Tuesday night, the night before a work day for me, she collapsed in the bathroom. By the time my sister and I picked her up off the floor, it was nearly 1AM, and I needed to get up at 6AM for a day of driving. My anger at her loss of ability (partly at myself and my sister for letting her off the hook on her exercises and just getting up and practicing), as well has her surrender to her fear of falling (which is part of why she collapsed), had me full of adrenaline, as did the physical effort of picking her up. That meant I couldn’t get my mind to shut down in time to get enough sleep to be safe on the roads. I had to call in sick. Thursday night ended up with the same sort of issue. I tried to tell her she needed to get going earlier so I could get to bed for work the next morning. I don’t know if she didn’t clearly hear me (since her hearing was destroyed by antibiotics) and she just nodded and said she understood when she really didn’t, or if she forgot what I had said, but she kept delaying, and again it was nearly 1AM by the time I got to bed. And again, I obsessed over trying to get sleep to the point I failed, and then I obsessed over calling in a second time in a row in the week. I tried to settle my mind with Tylenol PM, a white noise app, and eventually reading. I ended up pulling an all-nighter, reading a book nearly cover to cover. Tonight, as I write this, it’s 20 after 11PM, and she’s been in bed for about an hour. I’ll be able to get to bed on time and get to work tomorrow. Huzzah. I’m trying to read more fun stuff and spend less on the Internet reading political stuff or other distractions like games on my tablet. I think that’s part of getting back to being creative again. I know it is, so you can stop laughing now. The book I read Thursday morning as I tried to put myself to sleep is a reprint of one of the first graphic novels, called Blackmark by artist Gil Kane. Mr. Kane had an outline for his story, but knowing he wasn’t really an author, had a comic writer and editor named Archie Goodwin supply the actual text, while Kane himself supplied art. The story is about a slave gladiator for whom the story is titled. The story itself is a post-apocalyptic tale of revenge and violence in a retrograde medieval world haunted by psychic mutants and warring nobles. It’s a bit stereotypical to the modern reader, but in 1971, it was groundbreaking for those who could get a copy. Mine is a 30th anniversary reprint put out about 15 years ago, and I quite enjoyed reading it again, even if it is a bit dated. I also started re-reading Robin’s Laws of Gamemastering. Written by gaming guru Robin Laws, he explores ideas about gaming that were revolutionary in roleplaying games in 2002 (date of publication). Those ideas are now old hat, being the core ideas of many indie games. I’m enjoying the refresher course, and I’m thinking about my own play style and GMing style, as well as my own reasons for creating my own game, hopefully focusing my rule building, rather attacking things scatter-shot. I’m going to end this here and publish, or I will never finish. I don’t want to keep delaying, so I won’t. It’s been a few weeks. With two holidays on Sunday in a row, I had other things I’d rather do. And last week? I just kept putting it off, and about Wednesday this last week, I decided to give up. However, I did write an outline, which I don’t feel any real need to change and will follow for tonight. I really didn’t do a lot towards losing weight until late in the year. In the summer, I started walking for Pokemon Go!, but I didn’t stick with it. It was pretty boring to walk by myself, but we continued going out after Thursday Night D&D (now Fantasy Age Titansgrave) until just a few weeks ago. Rain and cold and illness has killed our motivation, as well as the general decline of the game. On the other hand, I’ve started cutting back on what I eat. I’m breaking myself of buying large sodas on breaks, and ordering ala carte more often. I doubt I’ve lost an ounce, but I’m feeling a little better when I eat less. It may not be much, but it’s something. And maybe as it warms up, I’ll get out walking again. I’ll have to find some kind of partner or something to motivate me better than Pokemon. I had a couple of various issues with the holidays. Family ignored me as I tried to talk to them, in one case literally walking away in the middle of a conversation. I got only one gift I consider in any way memorable, one of the Engine Publishing books. New Years was okay, but I ended up feeling ignored by the kids a couple of days later. This weekend was much better, but both incidents left me feeling a little like no one would miss me if I were to not be there. After missing a weekend last week, the kids were much better, but the birth family hasn’t had reason to change. But more on that in a minute. After having been sick just after Thanksgiving, I got sick again just after New Years. It really wiped me out that week. Wednesday after, I went to work and I ended up taking the rest of the week off and camping out at home last week. I’m still coughing tonight, but nowhere near as bad as I was. I’m tired of being sick so often. Not sure what’s happened to me over the past few years. I used to never get sick. But that was through college and the few years following. But since starting with the rental company, it’s been far more frequent. Although, when we were kids, we’d get bronchitis a lot, and I had walking pneumonia when I was 24, so I keep wondering if something back then has reared its ugly head again now. I just wish it would go away. The feelings of being taken for granted compounded feelings I’ve been having for a while: I need to change my living arrangement. I’m not happy here, for a multitude of reasons. Mostly, it’s the environment in the household. I’m frustrated with how things get done (or don’t), and the balance of power in the household. Unfortunately, I’m not in a financial state to change things. I have, however, considered just pulling up stakes and leaving Fresno regardless. I haven’t been able to find a better job here. My skills are out of date, and the expense to update them is creeping beyond me, and my credit rating is probably insufficient to get me aid. We’ve gotten to the end of Chapter 5 in the book. Now, to frame things properly, the first two of the ten chapters is worldbook and rules for the setting, and the rest is the campaign itself. So, we’re through 3/8ths of the story. I took the week off last week because of being sick, but week picked up this week. Everybody’s having fun, and we’re actually roleplaying, which we weren’t doing during D&D. I’m quite happy with the game as it stands. GRAmel has completed their Kickstarter for the new version of the game, and it’s now available on DriveThruRPG for backers, but not for the general public. My rewrite has stalled out. Of course, I mentioned that last time, and so really, I’m just saying the stall has continued. D&D for Kids starts again next week (because of me still recovering, cooking for our home game last night, and a MTG pre-release weekend at CSGS this weekend), so that is a distraction for me, as well as Titansgrave and the home situation. Again, I’m hoping that I’ll be able to focus more at some point soon, but I have no idea when that will be. That’s pretty much all I have for this entry. This is life right now. Worked out of Fresno after a rocky night of sleep. Mom got to moaning in pain once she got put to bed, but she wouldn’t fully awaken. So, I didn’t sleep well. Ultimately, once morning rolled around, Mom went back to the hospital, but will not be admitted. She is experiencing a mildly altered mental state, as well as some slurring of her speech, but the doctors can find nothing wrong with Mom. She is probably going to rehab for a while, though, and miss Election Day. That’s really all I’ve got for today. Maybe more tomorrow.